8 oz. Precisionware™ HDPE Narrow Mouth Bottle with Polypropylene Cap | U.S. Plastic Corp. 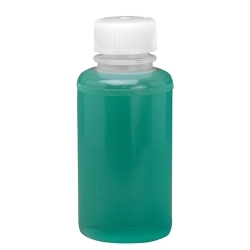 Rigid high-density polyethylene, laboratory/pharmaceutical grade bottles have matched polypropylene closures and leakproof design. Meets FDA standards. Ideal for packaging and storage of liquids and powders. Bottles feature recycling code molded into base.